The SNP majority at the Scottish Parliament pushed through the legislation aimed at tackling sectarian crime at football despite opposition to it. Controversial laws intended to crack down on hate crime at football matches have been pushed through the Scottish Parliament despite opposition to it. Football fans protesting against the bill turned out at Holyrood to highlight their opposition to it before it was passed through by the SNP majority on Wednesday. The Offensive Behaviour at Football and Threatening Communications will mean that offenders can receive a maximum five-year prison sentence for two new crimes. The first offence is aimed at targeted any offensive and threatening behaviour expressed at and around football matches which is likely to cause public disorder. While a second offence created on Wednesday relates to the communication of threats of serious harm or which are intended to stir up religious hatred on the internet or other communications. While the SNP championed the new legislation as bringing Scotland into the 21st century, all of the opposition parties at Holyrood voted against the proposals during a heated debate. Community Safety Minister Roseanna Cunningham welcomed the passing of new law. She said:"This Bill sends out an important message about the kind of Scotland we want to live in, because the vast majority of people in this country have no time whatsoever for the kind of mindless bigotry that has attached itself to the small minority who only damage and undermine our beautiful game - or those who peddle hatred by sitting behind a computer screen posting threats of harm on the internet. "This is the 21st century, and this kind of behaviour is simply not acceptable, so action had to be taken. The passing of these important new laws sends out a powerful message to the bigots that this behaviour will not be tolerated in a modern Scotland. She added: "The message today is, by all means enjoy the banter and passionate support for your football teams, even passionate opposition of other football teams - it is the lifeblood of football. But sectarianism and other expressions of hate are not acceptable and it is time for it to stop. From now on, those engaging in it will face the full force of the law." Labour, Conservatives, Liberal Democrats, Greens and Independent MSP Margo MacDonald issued a joint statement after the vote at Holyrood. It read: "Members of all political parties are determined to wipe the blight of sectarianism from Scottish society. It is of real regret that the first piece of legislation passed by this new parliament has been railroaded through by the SNP. "The SNP has used its majority to force through bad law that risks doing more harm than good. It sets a worrying precedent for this parliament. "The SNP has failed to make the case for the legislation both in parliament and out, with football fans, religious organisations, anti-sectarianism organisations, children's charities, the Law Society, the Human Rights Commission and the Scottish Justices Association all raising genuine concerns with the SNP legislation. "We believe a far more effective response is to focus on education and young people, working with the churches and football authorities on positive, practical, evidence-based measures that tackle the root causes of sectarianism, as well as robust application of existing laws." Anti-sectarianism charity Nil By Mouth’s campaign director Dave Scott said that the bill would not necessarily wipe out the bigoted offending. He added: "The debate around this bill has polarised the political parties but it has now become law and time will tell how effective and enforceable it proves to be. 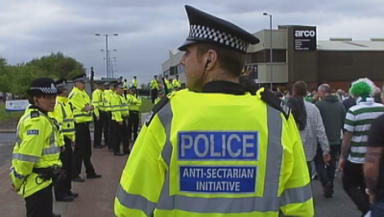 "However sectarianism goes far beyond football and Facebook. It exists in our institutions, workplaces, communities, and homes and the real battleground is not the terraces, but the hearts and minds of our people. "We do want to see another generation lost to the battles of the past so it is vital that we now focus on identifying, and challenging, the root causes of sectarianism."